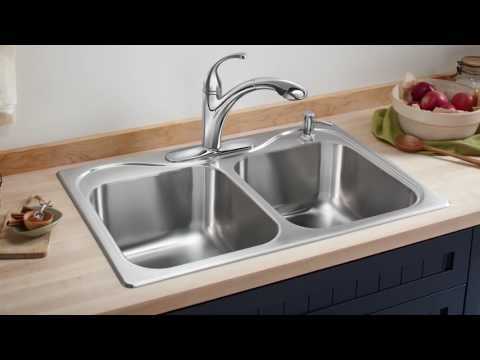 Under-Mount Single-Bowl Kitchen Sink, 23-5/8" x 21" x 9-3/4"
Decidedly different in style, the D-bowl design of this McAllister kitchen sink offers a fresh look to the kitchen while providing the durability and appeal of stainless steel. SilentShield(R) technology, an exclusive sound-absorbing system, reduces noise and vibration, and a flat-bottomed bowl helps prevent glassware from tipping. The optimized front-to-back dimension maximizes the amount of countertop material behind and in front of the sink. Decidedly different in style, the D-bowl design of this McAllister kitchen sink offers a fresh look to the kitchen while providing the durability and appeal of stainless steel. SilentShield© technology, an exclusive sound-absorbing system, reduces noise and vibration, and a flat-bottomed bowl helps prevent glassware from tipping. The optimized front-to-back dimension maximizes the amount of countertop material behind and in front of the sink. Dimensions: L 23-5/8", H 9-13/16", W 21", D 9-1/2"